We are the alumni Association for the Alpha Rho Chapter of Alpha Phi Omega at the University of Texas at Austin. We were founded in the Fall of 2010. We became an official alumni association with the national fraternity of Alpha Phi Omega in 2016. A. Persons who are duly registered in the National Office as initiated members of Alpha Rho chapter;B. 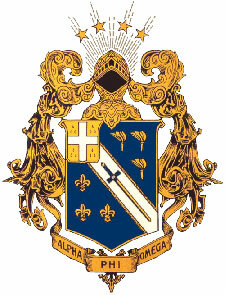 Persons who serve(d) as duly registered advisory members of Alpha Rho chapter; or C. Persons granted honorary membership in Alpha Phi Omega by the Alpha Rho chapter pursuant to the National Bylaws and Standard Chapter Articles of Association, however, D. The alumni association shall not grant any form of membership that does not comply with the above standards. E. Spouses and former Little Sisters are welcomed and encouraged to participate fully in the activities of this alumni association, but pursuant to National Bylaws, cannot be granted official membership. On March 11, 1935, thirty men met for the specific purpose of forming an Alpha Phi Omega chapter at the University of Texas at Austin. At the beginning of the year, a group of scouts and former scouts interested in forming a group for college men to continue their work in scouting, discussed affiliating with Alpha Phi Omega. Frank Dominguez III wrote to the national office concerning a petition of affiliation and received information about the fraternity and the requirements to establish a chapter. The first meetings were concerned with organizing a chapter, meeting the requirements and becoming friends. No time was wasted in organizing and establishing what was to become Alpha Rho. Dominguez was elected to correspond with Sydney B. North, national secretary of Alpha Phi Omega, and also to act as "grand master" of the group. The Austin men now began their activities with the local scout council by reorganizing several scattered troops and serving as scoutmasters. They also volunteered to assist with UT freshman orientation and to officiate upcoming track meets. The Alpha Rho chapter made its first public debut during the 1935 Round-Up parade in a car covered with sheets and with the fraternity pin. On April 1, 1935, the group met at Zilker Park for a barbeque. At this time, they chose the temporary name B.U.S.T.A (Boy Scouts of America, University of Texas). Games, a campfire, and the discussion of the planned formal installation were the order of business. The installation ceremony was to be held on May 25, 1935, and was conducted by H. Roe Bartle, the national president. The meal was served and the pictures taken. Roe Bartle, National President, introduced himself and began. The communications authorizing the installation of the chapter were read. The pledges took the Oath. President Bartle explained the purposes of Alpha Phi Omega and pledged the members in groups of five. Each man took another pledge and used the Fraternity handshake. Mr. Bartle presented the charter to the Faculty members and signified this chapter as the Alpha Rho Chapter of Alpha Phi Omega. Brother O'Neal presented each separate certificate to each member. Then Noel P. Ampstead, Scout Executive, presented each member with his pocket certificate. Mr. Bartle held officers elections. ​Mr. Bartle emphasized that this is a National Service Fraternity and gave a very interesting speech on the aims of the Fraternity. Dean Parlin spoke on the value of consulting the President of the University before any action was taken on different matters. The meeting was adjourned. Alpha Rho had its first coed pledge class in the Fall of 1976 (Ellsworth S. Dobson pledge class), even though the 1976 Convention vote was not held until December. Failure to go coed would have forced the University to withdraw official recognition of Alpha Rho and close the chapter's office essentials to retaining a charter. The Fall of 1977 brought the famous Aggie Attack in College Station. Texas Football was number one in the nation and Alpha Rho was even more determined to run our Texas flag on the Aggies' "sacred territory." However, the A&M Corps resolved to protect Kyle Field from violation. The Attack began as we ran onto the field. The Aggies' plan was to assault the members running the flag whose strength and stamina most closely matched their own; however, the Alpha Rho women prevailed. Kelsey Yarborough, who rendered the Aggie leader helpless with one swift kick, spearheaded the counterattack. In recognition of her bravery on national television, the chapter created the Kelsey Yarborough Golden Toe Award. (You don’t have to include this, but most really enjoy hearing this story). The Fall of 1978 held great promise in the form of the Lewis N. Jones Pledge Class; it was the largest class any chapter of Alpha Phi Omega had ever had. Over 160 were installed; over 130 were initiated. They began both the traditions of pledge class t-shirt and a pledge class party held for the actives. Later, the Fall 1997 pledge class of Alpha Rho (Father William T. Cunningham) surpassed the Jones pledge class by installing over 220 pledges and initiating over 160 into the active chapter, the Cunningham pledge class still holds the Alpha Rho record.